An iceberg is a large piece of freshwater ice that has broken off from a glacier or ice shelf and is floating in open water. Icebergs come in various shapes and sizes—for instance, the tops of some icebergs have peaks or domes, and the tops of others are flat. 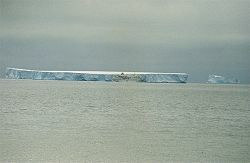 Winds and currents usually confine icebergs to areas close to the coastline. Given that the density of pure water ice is about 920 kilograms per cubic meter (kg/m³), and that of sea water is about 1025 kg/m³, typically only one-ninth of the volume of an iceberg is above water. The shape of the much larger portion below water is difficult to surmise by looking at the portion above the surface. This phenomenon has led to the expression, "tip of the iceberg," implying that a problem or difficulty may be much greater than what is immediately apparent. Collision with icebergs constitutes a serious hazard for shipping near the polar regions. A well-known example is the sinking of the RMS Titanic, which led to the death of more than 1,500 of its 2,223 passengers. Since then, special agencies have been set up to monitor icebergs and warn ships in their vicinity. The word iceberg is a partial loan translation from Dutch ijsberg, literally meaning mountain of ice, cognate to Danish Isbjerg, Swedish Isberg, Low Saxon Iesbarg, and German Eisberg. An iceberg differs from sea ice in that an iceberg is made of freshwater whereas sea ice is produced by the freezing of seawater. As a result, they differ in density, and the depth of sea ice is far less than that of an iceberg. Closely packed pieces of sea ice are called pack ice, and scattered pieces of sea ice are called ice floes. Icebergs generally range from 1 to 75 meters (about 3 to 250 feet) in height above sea level and weigh 100,000 to 200,000 metric tons (about 110,000-220,000 short tons). The tallest known iceberg in the North Atlantic was 168 meters (about 551 feet) above sea level, making it roughly as high as a 55-story building. Despite their size, the icebergs of Newfoundland move an average of 17 km (about ten miles) a day.. These icebergs originate from the glaciers of western Greenland, and may have an interior temperature of -15 to -20°C (5 to -4°F). The largest icebergs are calved (broken off) from the Ross Ice Shelf of Antarctica. Iceberg B-15 photographed by satellite in 2000, was the largest iceberg ever recorded. It measured 295 kilometers (km) (183 miles) in length and 37 km (23 miles) in width, with a surface area of 11,000 sq km (4,250 square miles). Its mass was estimated at around 3,000,000,000 metric tons. It broke apart in November 2002. 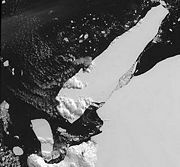 The largest remaining piece of it, iceberg B-15A, with an area of 3000 km², was still the largest iceberg on Earth, until it ran aground and split into several pieces on October 27, 2005. It has been determined that the cause of the breakup was an ocean swell generated by an Alaskan storm 6 days earlier and 13,500 kilometers (8,370 miles) away. When an iceberg melts, it makes a fizzing sound called "Bergie Seltzer." This sound is made by the popping of compressed air bubbles trapped in the iceberg. The bubbles come from air trapped in snow layers that later become glacial ice. Adélie penguins at iceberg in Ross Sea, Antarctica. Blocky: An iceberg with steep, vertical sides and a flat top. It differs from tabular icebergs in that its shape is more like a block than a flat sheet. The first person to explain the formation of icebergs was the Russian prodigy Mikhail Lomonosov. 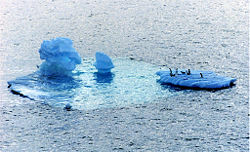 In the twentieth century, several scientific bodies were established to study and monitor icebergs. Before 1912, there was no system in place to track icebergs to guard against ship collisions. The sinking of the RMS Titanic created the demand for a system to observe icebergs. For the remainder of the ice season that year, the United States Navy patrolled the waters and monitored ice flow. In November 1913, The International Conference on the Safety of Life at Sea met in London to devise a more permanent system of observing icebergs. Within three months, the participating maritime nations had formed the International Ice Patrol (IIP). The goal of the IIP was to collect data on meteorology and oceanography in order to measure currents, ice flow, ocean temperature, and salinity levels. They published their first records in 1921, which allowed for a year-by-year comparison of iceberg movement. Newer technologies continued to be deployed to help monitor icebergs. Aerial surveillance of the seas first took hold in the early 1930s, which allowed for the development of charter systems that could accurately detail the ocean currents and iceberg locations. In 1945, experiments were conducted to test the effectiveness of radar in detecting icebergs. A decade later numerous oceanographic monitoring outposts were established for the purpose of collecting data; these outposts continue today to serve an important role in environmental study. A computer was first installed on a ship for the purpose of oceanographic monitoring in 1964, which allowed for a faster evaluation of data. By the 1970s, icebreaking ships were equipped with automatic transmission of satellite photographs of ice in Antarctica. Systems for optical satellites had been developed, but at this point were still limited by weather conditions. In the 1980s, drifting buoys were used in Antarctic waters for oceanographic and climate research. They are equipped with sensors that measure ocean temperature and currents. Side-Looking Airborne Radar (SLAR) made it possible to acquire images regardless of weather conditions. Currently, icebergs are monitored worldwide by the U.S. National Ice Center (NIC). Established in 1995, it produces analyses and forecasts of Arctic, Antarctic, Great Lakes, and Chesapeake Bay ice conditions. More than 95 percent of the data used in its sea ice analyses are derived from the remote sensors on polar-orbiting satellites that survey these remote regions of the Earth. On November 4, 1995, Canada launched RADARSAT-1. Developed by the Canadian Space Agency, it provides images of Earth for both scientific and commercial purposes. This system was the first to use Synthetic Aperture Radar (SAR), which sends microwave energy to the ocean surface and records the reflections to track icebergs. The European Space Agency launched ENVISAT on March 1, 2002, an environmental satellite which uses Advanced Synthetic Aperture Radar (ASAR). This can detect changes in surface height with a high degree of accuracy. The Canadian Space Agency is currently readying RADARSAT-2, which is scheduled to be launched in mid 2007. It will utilize SAR and multipolarization modes and will follow the same orbit path as RADARSAT-1. ↑ Online Etymology Dictionary, Iceberg. Retrieved November 10, 2007. ↑ Icebergs of Newfoundland and Labrador, Frequently Asked Questions with Short Answers and Pointers. Retrieved November 10, 2007. ↑ Canadian Geographic, Facts on Icebergs. Canadian Geographic. Retrieved November 10, 2007. ↑ Physorg.com, Alaskan storm cracks giant iceberg to pieces in faraway Antarctica. Retrieved November 10, 2007. ↑ USCG International Ice Patrol, Iceberg FAQ. Retrieved November 10, 2007. ↑ USCG International Ice Patrol, What are the sizes and shapes of icebergs? Retrieved November 10, 2007. ↑ Holly Gordon, The life and times of Arctic icebergs, Canadian Geographic. Retrieved November 10, 2007. ↑ Kathryn Carlson, Technology timeline. Retrieved November 10, 2007. Icebergs of The Arctic and Antarctic. This page was last modified on 25 January 2018, at 15:33.